I didn’t think I was writing about bullying. 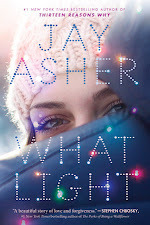 But after Thirteen Reasons Why was released, I began to hear from students who experienced things similar to what I wrote about. They often referred to it as bullying and said it helped to see their emotions expressed in a novel. 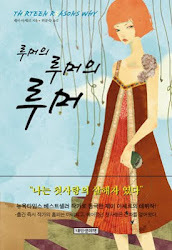 I also heard from students who treated others in ways similar to those in the book. They said they would be more conscious of not bullying from now on. 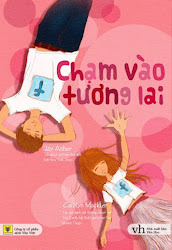 And I heard from teachers who used the book to help address the topic of bullying. So I guess I wrote about bullying. My definition had simply been too narrow. It also made me realize that I had experienced bullying when I was in school. And sadly, I realized that I sometimes bullied. Does a new understanding of the definition change the past? No. But it helps me understand the past. And the power that comes from a better understanding of ourselves and others is one thing I was trying to discuss within the book. This October, Thirteen Reasons Why turns seven years old. It has become more successful than I thought possible and has been used in more beautiful ways than I imagined. I receive daily messages from people who are using it to deal with bullying, either personally or as a community. And my publisher has read many similar messages left at thirteenreasonswhy.com. One thing that terrifies me as an author is coming across as preachy. When I wrote the book, I was afraid people would find it too sad or too serious or too message-oriented, so I focused on making it suspenseful. I wanted readers to have a hard time putting it down even when it got sad and serious and the message was right in front. When I began speaking at schools, I used humor as a way to avoid sounding preachy even when discussing the serious topics in Thirteen Reasons Why. My publisher now wanted me to tour the country and speak at schools, not merely as an author of a book, but as someone discussing an issue because of that book. If a school wanted to bring me in to help their discussion about bullying, an issue that has become important to me, I couldn't say no. And schools jumped at the chance to use this as a way to further those discussions. On average, for every school I visit on this 50-state tour, there are 13 more schools who nominated themselves as a tour stop (yes, of course it was 13!). While I would still love to hide behind my book and have it do the talking, there are certain things only an author can say. I have been bullied, and I have bullied. Like everyone, I have learned, and I am learning. As communities try to discuss and have a better understanding of the complexities of bullying, it is one of the greatest honors of my life to be a part of that. On October 1st, for my first tour stop, I will speak at my old high school in California. That afternoon, I will fly to Texas. From there, and throughout the school year, I will speak at a school in every state. You can follow along and be a part of the discussion at 50statesagainstbullying.com and help spread hope using #REASONSWHYYOUMATTER. 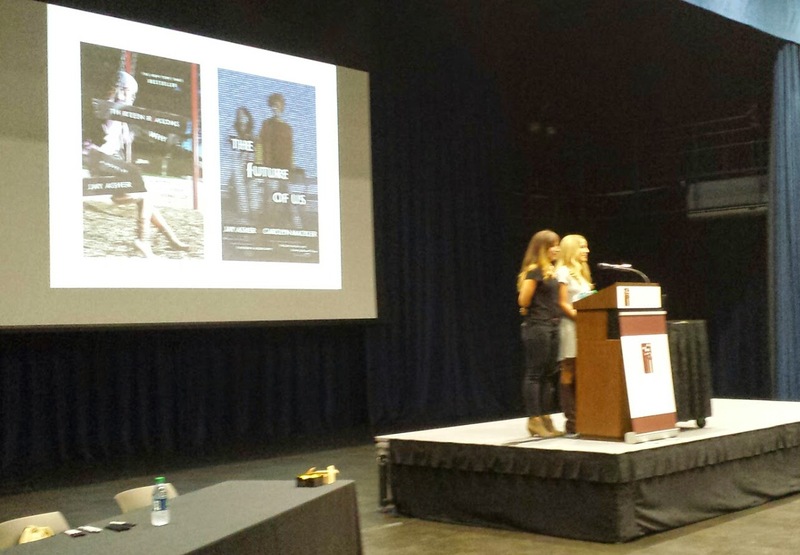 Last weekend, I spoke at the public library in Parma, Ohio as the YA author prize for teens in their summer reading program. You heard that right. I was a prize! But the teens didn't get just one author because they read so many books during the summer, they got three. My introduction was given by local authors, and hilarious co-writing sisters, Lisa and Laura Roecker. Here are most of the readers who showed up for my event. Many brought their own books to get signed, but each were also given a free copy of both Thirteen Reasons Why and The Future of Us. So there will be a lot of people getting signed books for the holidays this year! The last time I was in the area, my host drove me to the house used as Ralphie's home in A Christmas Story, which has been converted into a museum. Unfortunately, the place was closed by the time we arrived. I absolutely love the story behind the current use of this house. 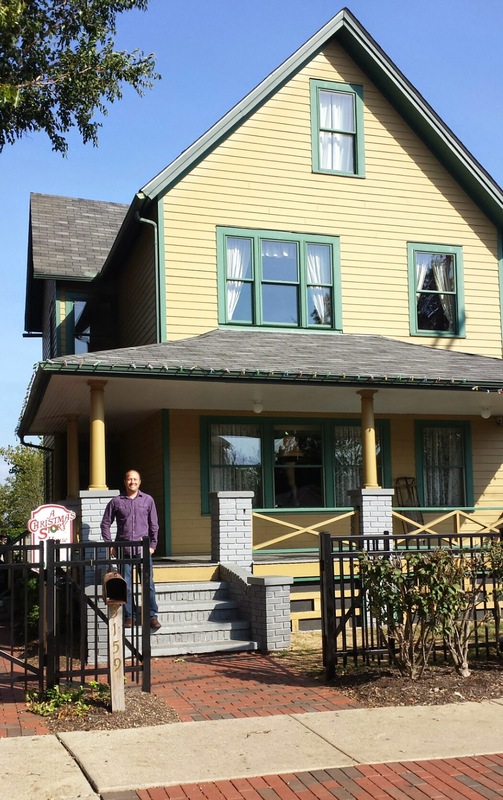 The owner bought it on eBay, renovated it to recreate its cinematic appearance (inside and out), and has formed a non-profit to help revitalize the surrounding neighborhood. All because of his love of a movie! If you could, which movie house would you love to buy and turn into a museum? I'll put my answer in the comments section. How did the owner get enough money to buy the house and turn it into a museum? 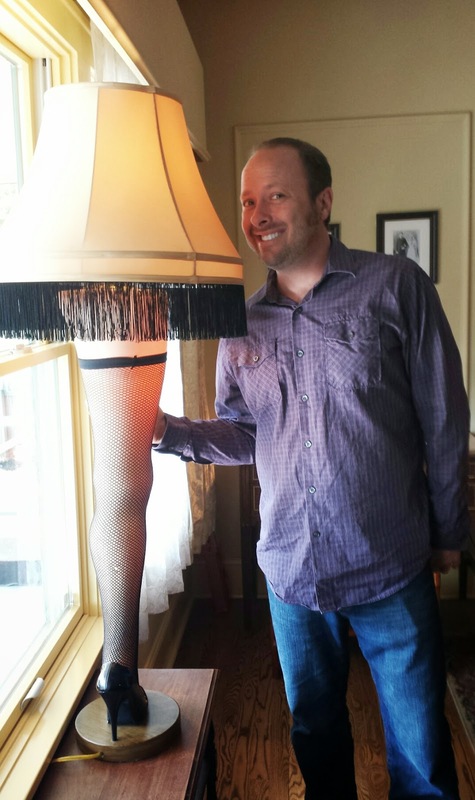 By selling versions of the leg lamp from the movie! Yes, the dude is awesome. Across the street, two other houses have been converted into a museum and a gift shop. The museum displays props from the movie. The gift shop features memorabilia from A Christmas Story, Christmas Vacation, and Elf. I bought a Christmas Vacation t-shirt (I watch that movie every year!) and a documentary called Road Trip for Ralphie about two movie nuts hunting down every filming location for A Christmas Story. They're total dorks and I totally want to go on a road trip with them! Visitors to the museum can place a pin on either their hometown on a map of the United States or on the flag representing their country. 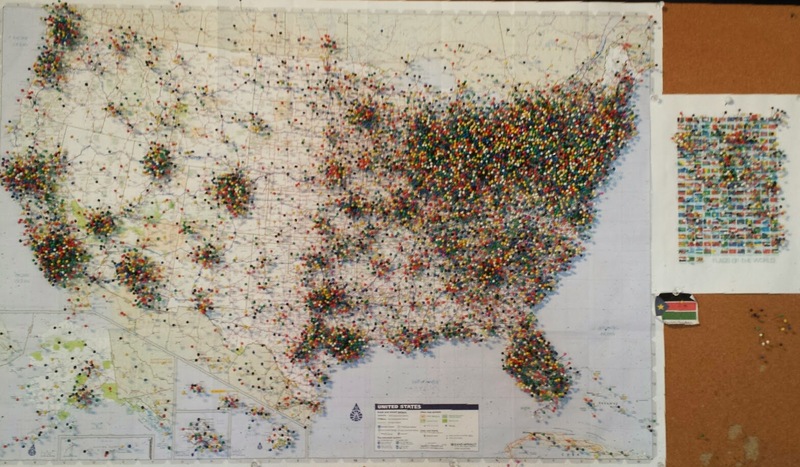 That map reminded me that on October 1st I will begin my own trip across the country on the 50 States Against Bullying tour. But before that begins, I hopped on a plane and returned home. Two weekends ago, I went down to the Los Angeles area for my grandmother's memorial service. But through sad times like this can come beautiful memories and family re-connections, and I think that would make Grandma Asher happy. Every couple of years during trips to the L.A. area, I like to take time and revisit important locations from my childhood in Arcadia, which is where my family lived until I was almost 13 years old. 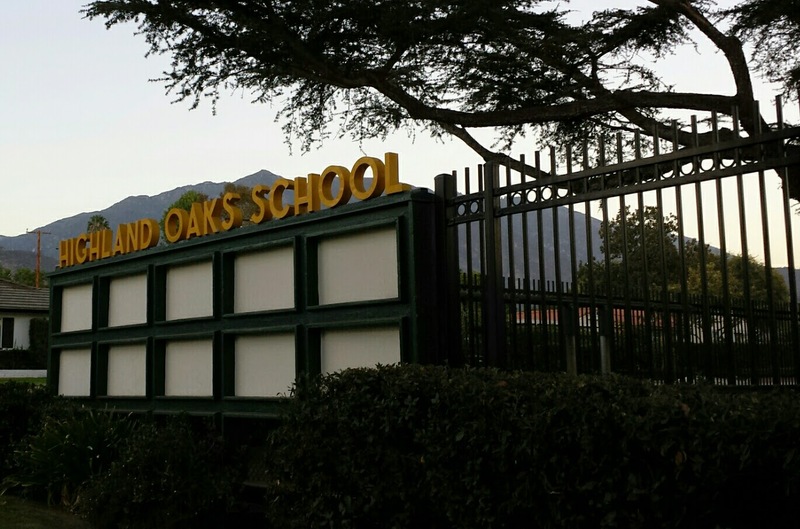 A good chunk of those memories came from my elementary school, Highland Oaks. Walking across the fields and past the classrooms twists my heart and warms my soul in so many fun, painful, and interesting ways. To compare how I viewed life then and now, and how I viewed myself then and now, is probably a healthy exercise for a writer. Or maybe not! Either way, I do it. And even if I don't look the same as back then, the oak tree in the middle of the "older kid" playground does! I drove by my old home, as well, which also looks much the same. 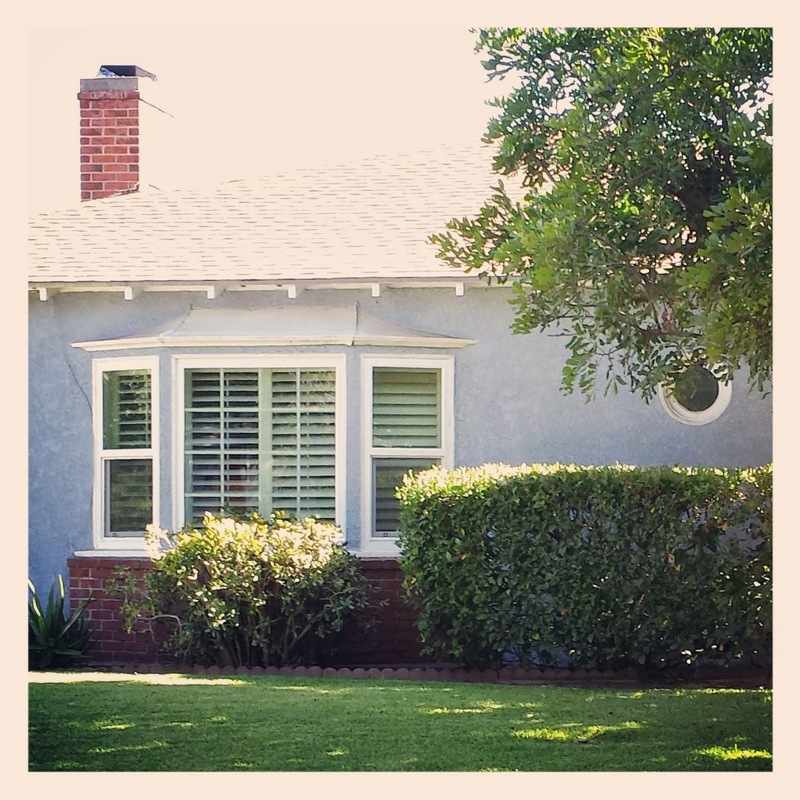 In that bay window, I spent many sunny and rainy days reading in a comfy chair, facing the San Gabriel Mountains, and the round porthole-like window was at one end of my bedroom. My mom recently told me that when we lived there, a previous owner stopped by to walk through the place to have his own nostalgia trip. I'm trying to gain the guts to do that myself. 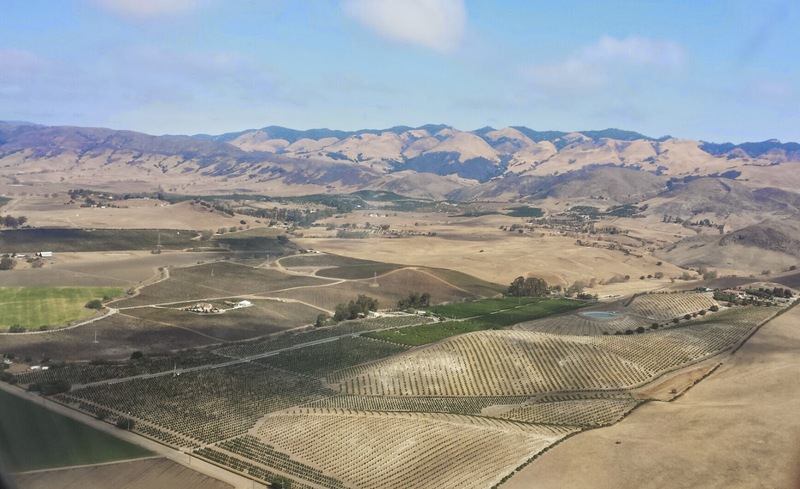 Last weekend, I went the other direction in California to Santa Rosa for my sister-in-law's engagement party. 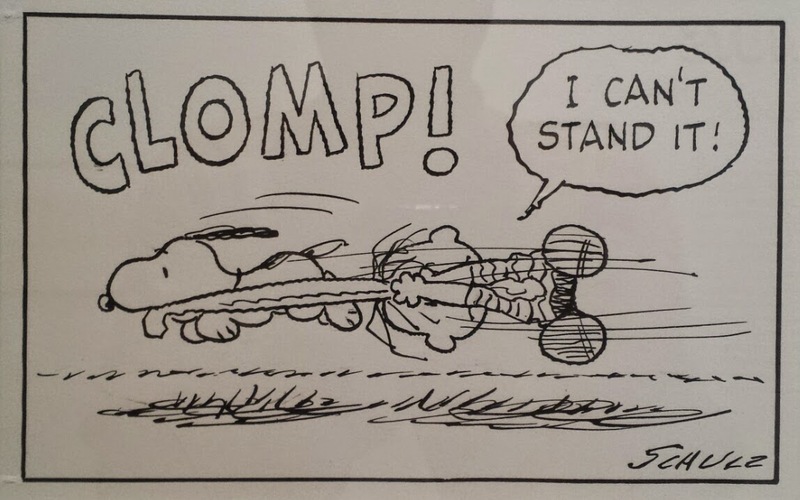 I knew I would also be making my second visit to the Charles M. Schulz Museum. If you've seen me speak about my journey as a writer, or have known me for some time, you know Mr. Schulz was a huge influence on me creatively. One of my most shared blog posts begins with a Peanuts strip, and if I ever get a tattoo there will be a recognizable Peanuts element to it (something else I need to gain the guts to do). 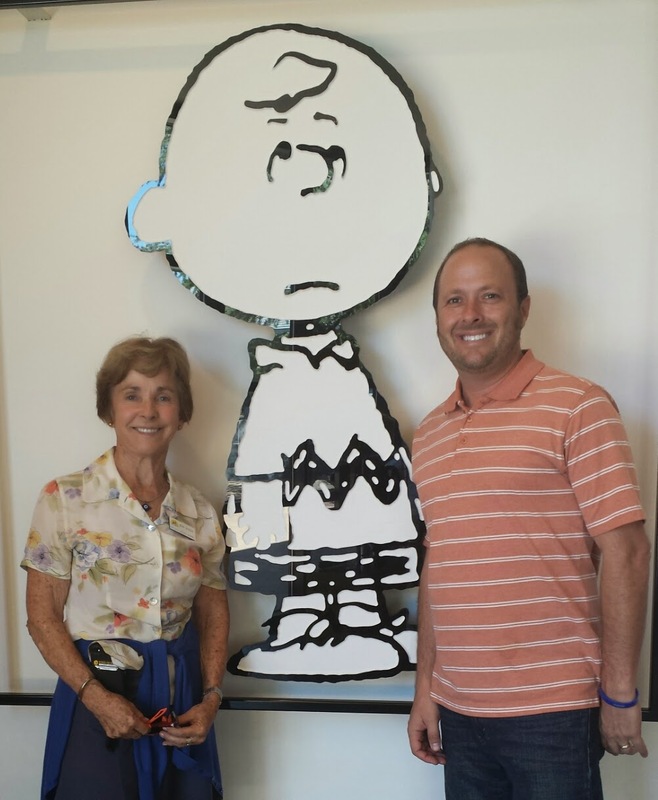 ...here I am with Ms. Schulz (or Jeannie, as I now call her!!!). She was way above the sweetness I'd hoped for, and was so generous with her time. She shared personal thoughts about some of the strips currently on display, and showed me design elements of the museum that were her ideas. She even signed a copy of Happiness is a Warm Puppy, the first Peanuts book, to my son and me. I also spent a few hours on my own in the museum. They have documentaries and cartoons you can watch, a recreation of the artist's studio (using the actual items and furniture he worked on and near), and memorabilia from his life. The pull for many fans is seeing the actual strips he drew, which are much larger than what appear in newspapers. These strips rotate several times a year, so repeat visits are necessary. And it is a real treat to see his ink lines up close. Just like Charlie Brown's dad in the strip, Mr. Schulz's dad owned a barbershop, which I've been fortunate enough to visit (actually, it's a bar now, but the bar recognizes its historical significance!). 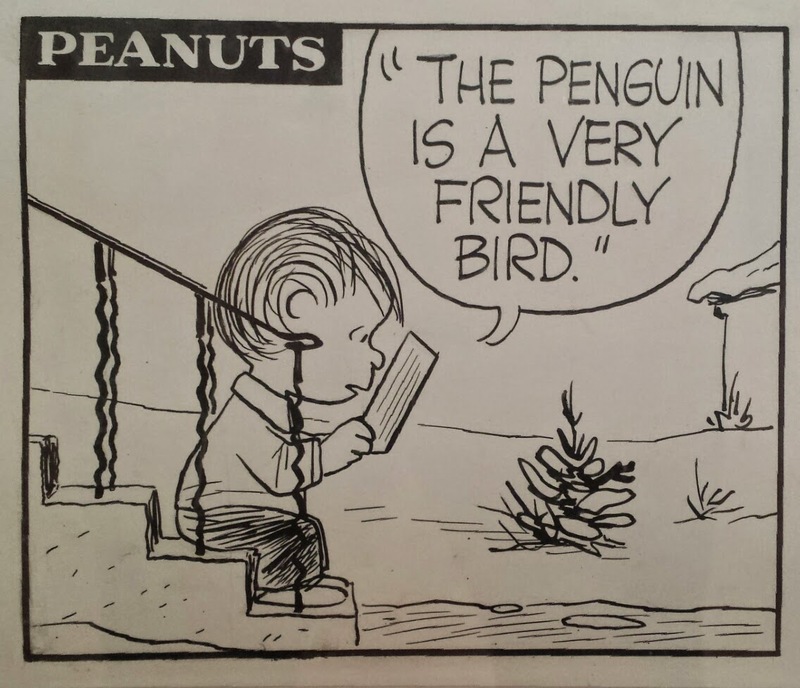 Apparently, just like me, Mr. Schulz liked to revisit places from his childhood. 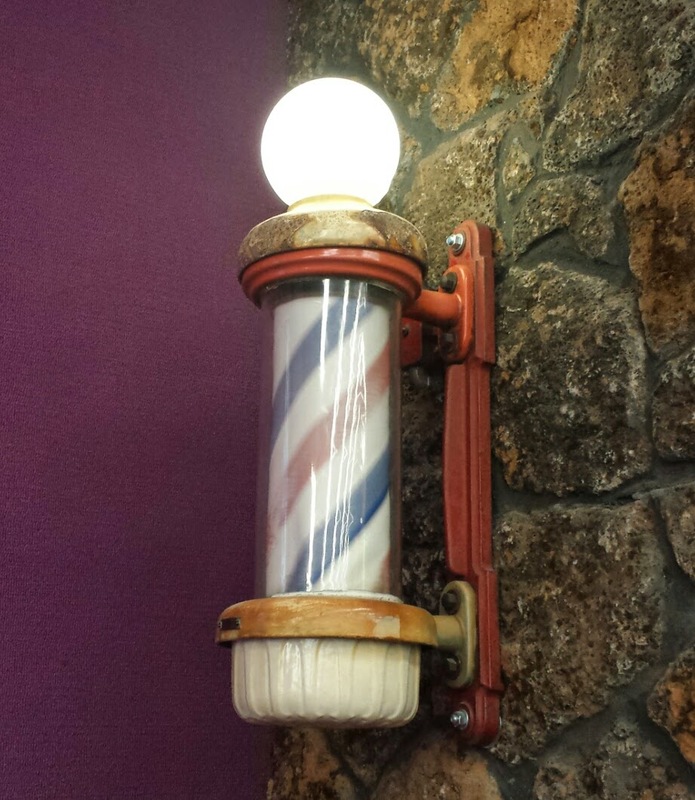 On a trip back to Minnesota in the 90s, he saw that his father's barber pole was still posted outside the building even though there was no longer a barbershop there. So he brought it back to California. 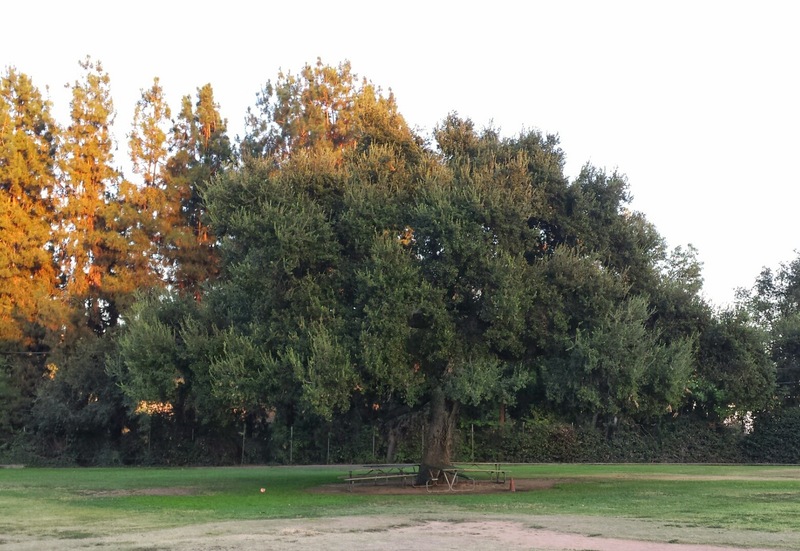 So maybe one day I'll move the oak tree from Highland Oaks and replant it in my backyard! But I'm sure there's a slightly better chance I'll get a tattoo before that ever happens.